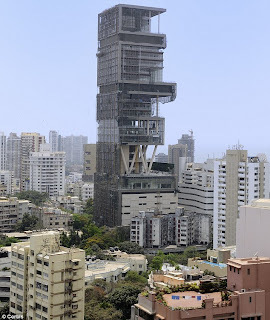 This is the extravagant £630m ($1bn) home built by a billionaire Indian tycoon to house his family-of-four in Mumbai. With 27 storeys, Antilia will be home to Mukesh Ambani and features a health club with a gym and dance studio, a ballroom, at least one swimming pool and a 50-seater cinema. Towering above the Mumbai skyline, the 37,000sq ft property is 570ft high and also boasts three helipads on its roof, space for 160 vehicles on its lower floors and nine lifts. Mr Ambani, 53, who owns much of oil, retail and bio-technology comglomerate Reliance Industries, paid £44million to build his dream property, but astronomical property values in the Indian city mean it is now worth 15 times that amount. He will employ 600 staff at the property and his family will live in the top floors, where they will enjoy views of the Arabian Sea.